The author, S.J. Matthews, gave me a copy of this novel in exchange for my review. 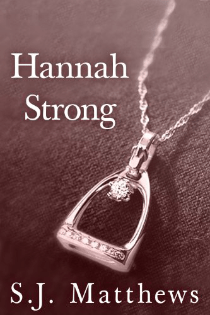 Hannah Strong is a powerful short story that introduces us to a woman set upon by demons. She suspects her husband is cheating; she knows her father is an alcoholic and Matthews hints at the relationship between Hannah and her mother and how desperately she misses that bond. Matthews colors in the edges of Hannah’s character well as we follow her through near panic attack — a night out with her friend — clash with her husband and ultimately taking the parental role in the relationship with her father. Hannah is well named. She’s a character that doesn’t think she’s strong, but the reader will understand that she’s a fighter. We know that life won’t be easy for Hannah, but she’s going to give it her best shot. Despite the emotional punch in this short story, the well-written character counterbalances the depth of emotion letting off some of the stress without lightening the impact. Matthew’s short story is set in New York City in the 1980s which can be a tricky thing to keep from being generic. The author pulls off the unique experience of Hannah within her city beautifully without evoking memories of the excess of movies of that era. I would hate to be one of those people who complain in reviews that they didn’t like how short the short story is but I could have spent a lot more time with Hannah in her world. Hannah Strong is a powerful and life-changing (for the character) lead into what will surely be an excellent and engrossing story. If you like tales of the human struggle in the spirit of great women’s literature of a bygone era, this short story is for you. S.J. Matthews is a horse lover who lives in Texas with her husband, son, dog and rabbit. For more information about her and her work, visit her blog Word Nerd. You can connect with S.J. Matthews on Goodreads page and Twitter @bluehorse72.